"Commercial Beekeepers - The Unsung Heroes of the Nut Business"
"Bill Lewis is waiting for the sun to set, the time of day when his bees crawl back inside the short white boxes that house their colonies. As the sky turns pink behind the San Gabriel mountains, on the outskirts of Los Angeles, Lewis climbs into the seat of a forklift and starts moving the hives onto the back of a flatbed truck. These bees are on the move. Bill Lewis of Bill’s Bees loads several hundred hives onto trucks in Lake View Terrace, CA., in order to drive them a couple hours north to pollinate almond trees for a few weeks. Credit: Tracey Samuelson/Marketplace "As soon as you get on the freeway and there’s air flowing past the entrances, all the bees run back inside,” says Lewis, of any stragglers. Lewis, who runs Bill’s Bees, is taking about 700 of his hives on a road trip to the California’s Central Valley, where he’ll unload them across acres of almond orchards, working until 1 or 2 a.m. under the light of full moon. All across the country, more than a million-and-a-half colonies are making a similar journey – traveling hundreds or even thousands of miles to pollinate California’s almonds. Farmers rent hives for few weeks because in order for almond trees to produce nuts, bees need to move pollen from one tree to another. “This pollination season there will be [some] 800,000 acres of almonds that need to be pollinated,” says Eric Mussen, a honey bee specialist at the University of California Davis. He says more than 100 different kinds of crops need these rent-a-bees, but almonds are significant for the number of acres that require pollination all at the same time. About 85 percent of the commercial bees in United States – which Mussen calls “bees on wheels” – travel to California for almonds. The state supplies roughly 80 percent of the world’s almonds, worth $6.4 billion during the 2013-2014 season, according to the Almond Board of California. In fact, bees are such an important part of the almond business that Paramount Farms, one of the biggest almond growers in the world, has decided they need to be in the bee business, too. The company just bought one of the largest beekeepers in the United States, based in Florida. Renting bees is about 10 to 15 percent of Paramount’s production costs, but the motivation to keep their own bees isn’t simply economic. “Many bee keepers are individual or family business and many people are getting on in years and we don’t see a lot of young people coming into the business,” says MacIlvane. Additionally, bee populations are struggling. A significant number having been dying each year for the past decade or so, thanks to a mix of factors, from pesticides to lost habitat for feeding. Sometimes it’s difficult to know exactly what’s killing them. “We had a large problem last year with bees dying in the orchard because of something that was going on during bloom,” says Bill Lewis. He thinks a pesticide or fungicide may have been to blame. 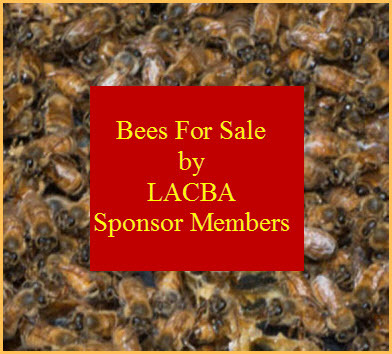 This year, Lewis and his bee broker are being pickier about the farms they’re working with, vetting them more carefully because those lost bees had big economic consequences – about $300,000 in lost income for Lewis." Steve Van Duyn looked around an almond orchard he manages southeast of Galt on a chilly morning, surveying the effects of California's weeklong run of freezing weather. Several nights with temperatures dropping below freezing have Van Duyn and other growers concerned about their crops. "We've sustained some damage," he said. "The full extent, we won't know for quite some time. In a few weeks, we'll know—we'll have a better guess—but we really won't know till harvest time." Van Duyn said he'd been irrigating orchards each morning, to help warm the blossoming trees as much as possible. The deep freeze that struck the Sacramento and San Joaquin valleys had many growers pulling all-nighters, trying to save their crops. "It was unprecedented for just a number of years, as long as I can remember, that we were up every night, Monday through Friday night," said Ripon-based almond farmer David Phippen. Mel Machado, director of member relations for the Blue Diamond Growers almond marketing cooperative, said reports from Glenn to Kern counties showed temperatures as low as the mid-20s, with many areas dropping to 31 to 33. Though Machado and others can put numbers on the temperatures, they can't do the same to the 2018 almond crop just yet. "Long story short, I can't walk into my brother's marketing office and say, 'Here's what the crop's going to be,'" Phippen said. Reports of damage vary widely. "Because of the stage of (bloom) development, because of whether you have water or not to apply, we will see fields that are virtually untouched adjacent to ones that are severely damaged," Machado said. "It's going to be that variable, and it's going to make it that much more difficult to really figure it out." California farmers harvested 2.1 billion pounds of almonds on 940,000 bearing acres during the 2016-17 season, according to the Almond Board of California. The objective forecast for 2017-18 calls for close to 2.3 billion pounds. The cold snap resulted from a shift in the weather pattern, said Jeff Barlow, a meteorologist in the Hanford office of the National Weather Service, who said weather systems had been "coming out of the Gulf of Alaska and dropping south across the Pacific Northwest and sliding into Northern California, and then coming across the Central California interior." At the orchard Van Duyn manages near Galt—one of the almond, walnut and winegrape operations he oversees in San Joaquin and Stanislaus counties—he said the third-leaf Independence trees produce 400-500 pounds per acre in a good year. "So if we come in with a crop of between 400-500, I'd say we had negligible damage," Van Duyn said. "If we come in at 200-250, I'd say we had a 50 percent crop reduction." Van Duyn found damaged blossoms in the orchard, but also found many that survived the freeze intact. "Every morning, we're up here running the water from about anywhere from 10 o'clock at night to 2 in the morning starts, and running them all the way till 9 o'clock, 9:30 before it warms up," Van Duyn said. That water is a crucial factor, said David Doll, a University of California Cooperative Extension farm advisor in Merced County. "Most farmers rely on the use of water applications at a rate of 30 gallons per acre per minute," Doll said. "This will warm the orchard by 2-3 degrees, depending on the dew point and temperature. Farmers can also use wind machines, but this isn't as common" in almonds, he added. Phippen said he's seen no crop damage so far around Ripon and Manteca, but orchards near Oakdale and Waterford weren't as fortunate. One 20-acre parcel owned and farmed by his son-in-law suffered severe damage, he said. Phippen added that he's guardedly optimistic about his crop, thanks in large part to the warm weather that set off the bloom earlier than usual. "We've never had this much frost, so that would tell you this isn't stellar," he said, "but the bloom has been one of the nicest blooms I've ever seen. There's been a long dwell on the bloom. The concurrent pollination from one variety to the other has overlapped beautifully. We've had a lot of bee flight hours. There's not a lot to be said negative about the bloom period that we've had. It's just that we had this frost along with it." Phippen said he thinks he'll know by the first of May how the harvest will shape up. An almond tree's vulnerability to frost will depend on a number of factors, Doll said. "As the tree progresses through bloom and into nut development, it becomes more sensitive to frost conditions," Doll said. "For example, the critical temperature at pink bud (beginning of bloom) is 25 degrees; at full bloom, it is 26 degrees; and at nutlet stage, it is 28 degrees. Extended periods at or below this temperature (greater than 30 minutes) will lead to crop loss." Citrus growers in the southern San Joaquin Valley used wind machines and irrigation to fight the chill, according to California Citrus Mutual. With nearly half of this season's crop already harvested, growers were aiming to protect next year's crop, as the warmer temperatures earlier in the month caused the bloom to arrive early. "The coming days will reveal if damage was incurred," Citrus Mutual said. "Growers are optimistic that if there is damage, the trees will have ample time to bounce back and push out another set of blooms this spring." Warmer temperatures could reach the Central Valley this week, Barlow said, as two weather systems reach California. "We are looking at anywhere from a half to 1 inch of rain in the valley, and then 1 to 2 feet of snow up in the high Sierra," Barlow said. "Then we go back to a warm and dry pattern for the weekend and into early next week." Average high temperatures at this time of year, he said, would be in the low to mid-60s. Average, of course, doesn't describe a year in which spring-like, short-sleeve weather was followed immediately by the forceful return of Jack Frost. "My dad is almost 84 years old," Van Duyn said. "He doesn't recall a year like this." Mornings in the California almond orchards. Jon and Jeremy arrive at their first honey bee hive location. A look in the hive. A closer look in the hive. Jon's pensive look in the hive. A growing colony. Almond blossoms. There's bees in these blossoms. All's well! Heading home! and “colony collapse” has proved to be a severe test. KERN COUNTY, Calif. — A soft light was just beginning to outline the Tejon Hills as Bret Adee counted rows of wizened almond trees under his breath. He placed a small white flag at the end of every 16th row to show his employees where they should place his beehives. Every so often, he fingered the buds on the trees. “It won’t be long,” he said. Mr. Adee (pronounced Ay-Dee) is America’s largest beekeeper, and this is his busy season. Some 92,000 hives had to be deployed before those buds burst into blossom so that his bees could get to the crucial work of pollination. But it is notable that he has a business at all. For the last decade, a mysterious plague has killed billions of bees every year. “Every year at this time of year, we wonder are there going to be enough bees,” said Bob Curtis, director of agricultural affairs at the Almond Board, a trade group for almond growers. Pollination services, as the bees’ work is known in the industry, has risen this year to between $180 to $200 a hive from an average of $154 a hive in 2006, Mr. Curtis said. There would be no almond crop — not to mention avocados, apples, cherries and alfalfa — without honeybees. Of the 100 crops that account for 90 percent of the food eaten around the globe, 71 rely on bee pollination, according to the United Nations Food and Agriculture Organization. commercial beekeeper as he ships his bees across California for almond season. Publish Date February 16, 2017. Photo by Melissa Lyttle for The New York Times. Demand for Mr. Adee’s bees is soaring in part because a poorly understood plague, known as colony collapse, has decimated the nation’s bee population in the last decade. The cause is widely debated: Some cite climate change affecting habitat, others the proliferation of certain pesticides, but most believe the problem has multiple factors. Whatever the reason, in the year that ended in April 2016, 44 percent of the overall commercial bee population died. In a typical year before the plague, only 10 percent to 15 percent would have died, and Mr. Adee’s losses would have been between 3 and 7 percent. “Over the last five years, I think this small industry could easily have lost $1.2 billion worth of bees,” Mr. Adee said. To put that in context: The total United States commercial bee business had a value of only about $500 million in 2012, according to the Honey Bee Advisory Council, created by Monsanto in 2012 to study its impact on bee health. Nor is the problem limited to honeybees. The bumblebee was scheduled to be listed under the Endangered Species Act on Feb. 10, but the Trump administration put the plan aside, pending further review. The E.P.A. has not responded to requests for comment. This is pollination season for America’s almond trees. As a result, in recent weeks almost two-thirds of the country’s commercial bees have started buzzing through California’s orchards. Some of the bees have been shipped in from as far away as Florida. Adee Honey Farms has some 92,000 hives, each with roughly 40,000 bees, about 3.5 billion bees in total. Most spend the winter here in hives scattered across a 3,000-acre cattle ranch surrounded by low hills with easy access to water, a necessity for such a concentrated population. During pollination season, the bees are loaded onto a dozen flatbed trucks and nine or 10 tractor-trailers and ferried to work, starting first in the almond orchards in late January, then moving to other California crops like broccoli and avocados. About 10 percent of the Adee bees are dispatched to Oregon and Washington State, where they pollinate cherry and apple trees. Bret Adee checked inside a hive on a ranch near Bakersfield, Calif. They work until early May, when the trucks take them to the Midwest for the summer. Like other commercial beekeepers struggling with the population decline, Mr. Adee has stayed afloat, in part, by acquiring the colonies of other beekeepers: The number of commercial beekeepers (those with more than 300 hives) has dropped, though no one is certain by how many. He has also been forced to split his colonies to rebuild his stocks, a process that entails moving some bees out of one colony and fooling them into building colonies around new queens. Nonetheless, his losses were so high last year that he had to borrow bees to fulfill his contracts. This year, thanks in part to the acquisition another beekeeper’s business, he had bees still waiting for work as he deployed his hives across California in late January. Neonicotinoids are a class of insecticides that are widely used to kill off aphids and other bugs. Some studies tie them to the declining health of bees and a drop in the populations of birds that depend on those insects for food. In 2013, the European Union and several countries in other areas placed limits on the use of those insecticides. “The more you study it, the more obvious it becomes: the relationship between the pesticides that have been sprayed everywhere over the last 10 years and what’s happening to bees,” Mr. Adee said. Not that he blames any one thing for the problem. Rather, it is that comprehensive research is rarely done, which, he said, would implicate a variety of factors. James Frazier, a bee expert at Pennsylvania State University, agreed. The bee shortage has to do with the overall health of bees, and not one or two specific things. Bees are exposed to a variety of pesticides, all of which can affect their immune systems, he said. That in turn makes them less resistant to diseases and parasites carried by the varroa mite and enables the spread of viruses. “It’s more complicated than trying to cure cancer,” Dr. Frazier said, “because bees are outside, where you have all these uncontrollable things working on them. Bees from one keeper are mixing with those from other populations as their numbers fall. That may aid in the spread of diseases and parasites, said Ann Bartuska, the acting under secretary for research, education and economics at the Agriculture Department. Vernon Adee and his son, Richard, raised bees for honey production only. But as that business began to suffer from competition from Chinese and Latin American honey producers, Bret Adee and his brother Kelvin, sons of Richard Adee, figured they needed to develop another business to keep the company afloat. So in 1990, Bret Adee and his wife, Connie, packed their two children (they now have four) into a truck loaded with beehives and moved to Bakersfield, Calif. Today, the pollination business provides two-thirds of the company’s revenue and all of its profits, Mr. Adee said. Because of imported honey, “There’s no money in honey any more,” he said. Nonetheless, his daughter Elizabeth has started selling the family’s honey in farmers’ markets, a tactic she hopes will help revive that portion of the business. When the Adees arrived in Bakersfield in 1990, there were 411,000 acres of farmland planted with almond trees, according to the Agriculture Department. Since then, the number of acres of almond trees has more than doubled, and growers have adopted techniques that are less bee-friendly. Growers previously flooded their orchards with warm water in the early spring to prevent frost from killing the buds. The water gave rise to grasses and weeds like dandelions and wild vetch between the rows of trees, giving the bees a source of pollen before the buds burst into bloom. But now, growers aim to conserve water, and because weeds and grasses can trap cool air that can lead to frost, most almond ranchers spray herbicides to keep the rows between their trees free of unwanted growth. To safeguard his bees, Mr. Adee’s employees lay a pad made of yeast, sugar and other nutrients under the lid of a hive to give the bees something to eat before the trees bloom. He also scouts out areas close to uncultivated land or grazing areas with water nearby. His bees spent last fall and early winter in hives scattered about a ranch ringed by the foothills of the Diablo Range and close to aqueducts and other water sources. “They’re far away from anything bad for them,” he said. At the ranch, cattle lazily grazed in the evening amid neatly stacked clusters of hives, looking on curiously when flatbed trucks pulled into load the bees for overnight journeys. The deployment of bees resembles a military operation, with Mr. Adee serving as its commander. Hives must be loaded onto trucks in the evening, four hives at a time on pallets precariously balanced on a forklift. Each truck transports 216 hives over dirt roads that, thanks to this season’s rain, were deeply rutted and thick with mud. The Adee bees rent for $200 a hive. On average, Mr. Adee places two hives per acre of almond trees. A 4,500-acre almond orchard would require about 9,000 hives, although growers are free to specify the number of hives they want. During pollination season, he typically leaves home at 5:30 a.m. and heads for an orchard or field to map the day’s plan. He relies on two thermoses of coffee to keep him going. Placing flags to mark the spots in orchards where hives are to be placed gives Mr. Adee a chance to survey the terrain. If a row of trees happens to have a low spot, he will place a flag a few rows away to ensure the hives do not stand in water. If his pickup slips in the mud, he makes a call to warn drivers not to take their much heavier equipment down the same path. Mr. Adee marks plot maps with neon Sharpies, using a different color to indicate which crew is to deliver which bees to a particular spot. After setting his crews in action — roughly 100 employees during pollination season, Mr. Adee then makes a second and sometimes a third round of deliveries to orchards, stopping occasionally to right a hive or gently squeeze the tips of branches to gauge when they might bud. He then has an idea when his bees might need to be fed again. Between stops, he talks on the phone — when his cell gets a signal, that is. In one call, he spoke to his foreman about two trucks needing repair. Then he called an independent trucker to see if he could move bees that night, diplomatically sidestepping the man’s request that he also hire a friend. “Well, I won’t know until tonight what’s needed,” Mr. Adee said. Shortly after the film came out, though, he also lost almost all the family’s bees. But the losses stretched on, into a fourth and then fifth year. Last year, after having lost roughly half of his 90,000 hives, he joined Mr. Hackenberg, other beekeepers and environmental groups in a lawsuit against the Environmental Protection Agency. The suit contends that the E.P.A. broke the law by failing to require registration of seeds coated in pesticides, as many genetically engineered seeds are. “E.P.A.’s actions and inactions have caused both acute honeybee kills and chronic effects leading to excess bee colony mortality, excess bird mortality, nationwide water and soil contamination, and other environmental and economic harms,” the plaintiffs argued. There is no federal insurance program to cover beekeepers. The federal 2008 Farm Bill did allocate $50 million in emergency assistance to cover losses in livestock, farm-raised fish and honeybees, but only through 2011. A year later, the Agriculture Department estimated that beekeepers had spent $2 billion to replace the 10 million hives they had lost in the six years since bee colonies first began experiencing declines. Here, the almond trees are just beginning to bloom. Mr. Adee’s bees work alongside their boss, who is working the phones. their bees on Tuesday, January 26, 2016 at a holding area in Yuba County. In the coming months, millions of bees will be deployed to help pollinate orchards. "There is a lot of doom and gloom in the industry right now with unexplained bee colony losses, drought, varroa mites, viruses and dropping honey prices," said Philip Russell, with Strachan Apiaries in Yuba City. "I guess the bright spot would be that we are still here and so are the bees." Russell, who was out with a crew on Tuesday taking inventory of some of their estimated 11,000 bees, said there are other positive notes. "There's also becoming more awareness about the plight of the bees and other pollinators," Russell said. "This awareness has reached all the way up to the president, who set certain policies in order to ensure cooperation between government entities and beekeepers." According to the White House website, honey bee pollination adds more than $15 billion in value to agricultural crops each year and in 2014 the president established a Federal Strategy to Promote the Health of Honey Bees and Other Pollinators. Lynn Kimsey, professor of entomology at UC Davis, detailed some of the issues surrounding honeybees and the substantial role they play in agriculture. "There's a problem with nutrition. There are long periods of time in the summer when there's nothing for them to eat," said Kimsey, who is also the director of the R. M. Bohart Museum of Entomology. "Sugar water doesn't have the nutrients needed, and it's especially a problem for baby bees." She said mites and the diseases transmitted by mites are also problematic. The pesticides and the miticides used to control the mites can negatively affect bees. Russell said awareness about the plight has brought a boom to smaller operations and hobbyist beekeepers but even that has a downside. "They don't always know the rules and regulations that have been followed by beekeepers for years or even those set forth by each county ag commissioner," Russell said. "These include a spacing minimum of a mile from other beekeeper locations that are already established, registering your hives and locations with the county." Russell said that ensures smaller operations and hobbyist beekeepers who don't treat their bees for pests or diseases will not infect neighboring hives. "Commercial beekeepers are aging out, and it's hard work," said Kimsey, who added the average age is about 60. "There's a big push to have hobbyist beekeepers, which is good but not enough to handle all the commercial operations." Kimsey said in the coming months, growers will have to import 1.5 million colonies, and with 30,000 to 50,000 per colony, that's a lot of bees. "The number is huge and they simply can't keep enough healthy bees in California," Kimsey said. "Moving the bees, especially along bumpy roads, can also stress them." Russell said most of their business is within the surrounding counties, but they have clients as far south as Fresno. "Locally, we use them on almonds, prunes, and crops used for seed like melons, sunflowers, squash, pumpkins, onions, carrots, cilantro and alfalfa," said Russell. "People also use them in Washington and Oregon for apples and cherries." California almonds could become carbon-neutral or even carbon-negative if growers were to make full use of practices such as shell, hull, and biomass recycling, according to new research in the Journal of Industrial Ecology. Eighty percent of the world's almonds come from the drought-stricken state, and production operations there have drawn much ire since studies showed that almonds are a particularly water-intensive crop. However, the new research shows that the energy and greenhouse gas footprints of almonds can be lessened by, for example, using shells, hulls, and orchard biomass to generate electricity or feed dairy cows. Soils and woody biomass in almond orchards also temporarily store carbon, and when this is taken into account, their greenhouse gas footprint may be reduced by an additional 18 percent, the researchers say. "Our research shows 1 kilogram of California almonds typically results in less than 1 kilogram of CO2 emissions," said author Alissa Kendall, which is "a lower carbon footprint than many other nutrient- and energy-dense foods." The almond is having its moment. tastes have all fueled demand. That’s sent major U.S. food makers such as Hain Celestial Group Inc. and JM Smucker Co. into the market, where they’re vying against smaller suppliers. Almond butter now comes in a range of flavors, including maple and dark chocolate. The headlines have been unavoidable. Almonds have been painted as our state's "thirstiest" crop, but what these stories lack is context. The management team from the Blue Diamond Growers cooperative has been collaborating with industry experts to communicate the facts about agricultural water use to the media and our urban neighbors. According to a recent editorial in the San Jose Mercury News, "California's dams and reservoirs were never envisioned to release water year-round for environmental objectives such as aiding the delta smelt or reintroducing salmon in the San Joaquin River watershed. A majority of reservoir water once intended for households or farming is simply sent out to sea." Clearly, our solution to California's water situation will require a collaborative effort among all Californians to find a solution that makes sense for everyone. The drought debate continues as we enter the hot, dry summer of the Central Valley, with mandatory water restrictions now in place throughout our state. For many Californians, that means the drought will now affect their day-to-day lives. Millions of urban Californians will have to join agriculture in the fight to save water and push for storage to protect our future. Gov. Brown's mandate made it clear that all Californians need to do their part to conserve our most precious resource, and yet the media firestorm aimed at agriculture, and almonds specifically, has been fierce. Our message has been simple: All food takes water to grow. California's agricultural abilities are second to none. In fact, according to the California Department of Food and Agriculture, nearly half of our country's fresh fruits, nuts and vegetables come from California. And CDFA reports that from 1967 to 2010, California agriculture has increased revenue and decreased total applied water use by 20 percent. In order to achieve such an impressive statistic, access to a consistent water supply is key. The amount of water required for California farming to grow our food is only 40 percent of captured water, with environmental projects taking the majority at 50 percent. The often-quoted 80 percent ignores any water used for environmental purposes. I have read suggestions that agriculture has been let off the hook by the governor's mandate. Here are the facts: In 2014, farmers received only 5 percent of their contracted State Water Project allocation and 0 percent from the federal Central Valley Project. This year, farmers are projected to receive 20 percent of State Water Project allocation and again, 0 percent of CVP water. Our farmers have been feeling the effects of this drought from the very beginning. Some have questioned whether agriculture's economic impact justifies the amount of water used by the industry. The media points to agriculture's 2.8 percent share of the state GDP, but again, this figure lacks context. It does not tell the whole story. Getting our food from farm to fork involves an interconnected supply chain, undoubtedly contributing significantly more than 2.8 percent to the state's economy. The almond industry alone contributes 104,000 jobs to California, 97,000 of which reside in the Central Valley, and more than 37,000 additional jobs throughout the supply chain. Speaking of almonds, there are 9 million acres of farmland in California and almonds account for 12 percent of that total, while only using 8 percent of the water currently used for agriculture. Almond crops produce more than just the kernels humans eat, which provide an efficient source of a heart-healthy, plant-based protein. The almond crop also produces hulls and shells that provide feed and bedding for livestock animals. Almonds rank No. 1 in California for food exports out of the state, with North America consuming four times more almonds than any other market. Our industry is a global driver of $11 billion in economic activity for California. In the last 20 years, California almond growers have reduced the amount of water required to grow a pound of almonds by 33 percent. Nearly 70 percent of almond growers use micro-irrigation systems and more than 80 percent use demand-based irrigation scheduling. No one in the world can produce a high-quality almond as efficiently as we can in California. In times of crisis, there are people who look for someone to blame. Almonds were the first target. Through sharing a few facts about our water stewardship, the media tide has turned to more balanced reporting. As the weather continues to warm into the summer, I expect agriculture will continue to field questions from our urban neighbors about water. Rest assured that Blue Diamond is committed to collaborating with our industry peers, water and environmental experts, consumer groups, regulatory bodies and policy makers to establish a water policy that makes sense for all Californians—rural and urban, Central Valley and coastal, producers and consumers. Bill Lewis is waiting for the sun to set, the time of day when his bees crawl back inside the short white boxes that house their colonies. As the sky turns pink behind the San Gabriel mountains, on the outskirts of Los Angeles, Lewis climbs into the seat of a forklift and starts moving the hives onto the back of a flatbed truck. These bees are on the move. “As soon as you get on the freeway and there’s air flowing past the entrances, all the bees run back inside,” says Lewis, of any stragglers. This year, Lewis and his bee broker are being pickier about the farms they’re working with, vetting them more carefully because those lost bees had big economic consequences – about $300,000 in lost income for Lewis. Covered in white blossoms, California almond orchards are now teeming with millions of honeybees that have been placed into orchards to pollinate the season's bloom, brought on early by sunny winter weather. Successfully pollinating the state's 860,000 bearing acres of almonds will require an estimated 1.7 million bee colonies that come from beekeepers in California and out of state. The apiary business has experienced many challenges the past several years, including significant bee losses from the mysterious colony collapse disorder, mite problems, a lack of forage and impacts attributed to crop-protection materials applied during bloom. "In an environment where bee supply is always in question every year, it gives us a little bit of security to have our own bees," said Gordon Wardell, Paramount director of pollination operations. "The stronger the colony, the better the pollination. In a year like this when we have a very compressed bloom, it's very important to have strong colonies to get out there and hit as many flowers as possible." "The beekeeper (we had used) lost half of their hives two years in a row and notified us in January saying, 'We only have half of what you need.' This is really what spurred us to buy our own bees (in 2005), just that fear of being without bees for pollination," Cosyns said. "We got into the bee business to run our own bees, but then we inherited leased bees and some other accounts, but beekeeping wasn't really in our initial plan." "For us in the Sacramento Valley, about one-seventh of the cost of producing a pound of almonds—a variable cost of production—is for bee rent. So, if you are inclined for vertically integrating and taking control of a critical input, bees are a natural place to look," Cummings said. "It is not only profit motivation and securing the inputs, but beekeeping is an interesting facet of a critical component of farming almonds." "One of my bigger growers tried to manage his own bees, but it didn't work out and he had to rent more bees from me this year than the year before," Pankratz said. "Now, with the lack of forage and the drought, if you are not an experienced beekeeper you are really going to have a hard time with keeping bees if you don't know what you are doing." "Training guys takes a lot more than you think, for them to get it where you can send them out on their own," he said. "Beekeeping is a tough thing to vertically integrate into," Cummings acknowledged, citing the "specialized knowledge and commitment" needed. "It is a very special individual that can do that, because beekeeping isn't easy by any stretch of the imagination." Regarding whether more almond growers will decide to manage their own bees, Paramount's Wardell said he believes "other almond growers will watch to see how it works for us." "Growers have tried this in the past and haven't always been successful, but there are almond growers that do own their own bees already," Wardell said. "It will be interesting to see if other almond growers do follow suit and do try to acquire their own bees." 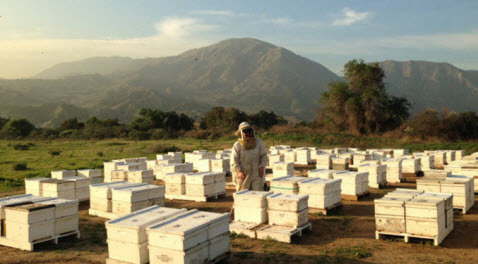 In keeping with its other farming endeavors, the division managing bees for Paramount will be called Wonderful Bees and could market honey products, he said, although its primary focus is pollinating almonds. "With the self-fertile almond, you can reduce the number of colonies in the orchard, but you still have to have a pollinator. Even then, we'd still need 45,000 colonies at one colony per acre," Wardell said. "Blue orchard bees do a great job and complement the honeybees very well, but we're having trouble getting the numbers up to do the level of pollination that we have to do." New to pollination this season is a set of bee "best management practices," released last fall by the Almond Board of California as a guide to improve honeybee health. Practices were developed with input from almond growers, beekeepers, researchers, chemical registrants and regulators. The board described the practices as steps farmers can take with beekeepers to protect and promote bee health. "It seems there is a little more blooming in the pastures and the grape vineyards, but with the number of hives that are here, the forage pretty much evaporates," he said. Beekeepers and almond growers are concerned--and rightfully so--about the some 80,000 bee colonies that died this year in the San Joaquin Valley almond orchards. In monetary terms, that's a loss of about $180,000. But the loss isn't just financial. It could have long-term effects. Beekeepers believe that pesticides killed their bees after the almond pollination season ended but just before they could move their bees to another site. This is a serious blow to both industries. Growers need the bees to pollinate their almonds. Now some beekeepers are vowing this is it; they'll never to return for another almond pollination season. Extension apiculturist Eric Mussen of the UC Davis Department of Entomology and Nematology talks about the issue in his latest edition of from the uc apiaries, published today on hiswebsite. "When should the colonies be allowed to leave the orchards?" he asks. "When pollination no longer is happening. That does not mean that the bees should remain in place until the last petal falls from the last blossom." "Why might beekeepers desire to move their hives out of the orchards 'early?' Once the almonds no longer provide nectar and pollen for the bees, the bees find replacement sources of food. Unfortunately, those sources may be contaminated with pesticides that almond growers would never use when the bees are present. Some common pests that surge right near the end of almond bloom include Egyptian alfalfa weevil larvae and aphids in alfalfa, and grape cutworms in vineyards. Delayed dormant sprays sometimes are being applied in other deciduous fruit orchards, even when the trees are in bloom. Often blooming weeds in the crops are attracting honey bees. If the year is really dry, the bees may be attracted to sugary secretions of aphids and other sucking bugs." Mussen says it's "not difficult to see that accidental bee poisonings often happen. Despite our California regulations requiring beekeepers to be notified of applications of bee-toxic chemicals within a mile of the apiaries, bees fly up to four miles from their hives to find food and water. That is an area of 50 square miles in which they may find clean or contaminated food sources. Thus, growers whose fields are 'nowhere near' any known apiary locations may accidentally kill many bees with chemical applications." "It seems," Mussen says, "that a combination of exposures of colonies to truly bee-toxic insecticides, followed by delayed effects of exposure to fungicide/IGR mixes during bloom, really set the bees way behind. The problem proved so severe that a number of beekeepers stated that they were never returning to California for almond pollination. That is not a good thing, since we really don't have too many colonies coming to almonds as it is." In his newsletter, Mussen goes into depth about when and how bees pollinate the almonds and what could be causing the problem and how it can be resolved. His take-home message? "Our honey bees cannot continue to be exposed to as many toxic agricultural products as they are, or we will not have enough bees to fill the pollination demand for our nuts, fruits, vegetable, forage and seed crops." The following is brought to us by the American Bee Journal. With many almond orchards reaching full bloom by the third week of February, California growers appear to have all the bees they’ll need to pollinate their trees this season. That contrasts with last year when growers barely had enough bees due to adverse weather and a poor honey crop in 2012 in California and many other areas of the country that supply the bees. Bee industry veteran Joe Traynor, whose company, Scientific Ag Co., Bakersfield, Calif., provides pollination services, offers a similar assessment. “It looks like the numbers will come out even between what the growers want and what the beekeepers can provide,” he says. One reason is that beekeepers responded to the small supply of bees for last year’s almond crop by boosting their colony counts in 2013. To hedge against winter losses, beekeepers typically increase bee numbers by splitting about 10 percent of their colonies into two separate ones in spring and summer. In 2013, many beekeepers boosted their number of splits to cover 30 percent to 40 percent of their total bee numbers. This provided a good supply of replacements and extra colonies across the country to meet the increased demand. “Imagine a cattle rancher increasing a herd by 30 percent to 40 percent a year just to cover potential losses,” Wardell comments. As it turned out, this past winter in many areas wasn’t as hard on the bees as usual and new mite control measures resulted in lower than expected winter losses. The exception occurred in some areas of the upper Midwest where losses were heavy. Otherwise, around the country bee numbers were generally good. With more bees to begin with and lower winter losses, beekeepers ended up with a good supply of bees for this year’s almond pollination, he notes. The number and condition of bees available for this year’s almond bloom varied among different regions of the country. For example, cooler, wetter weather in Wisconsin, Minnesota and the Dakotas last summer, reduced the number and strength of the hives there. Meanwhile, lower winter mortality rates resulted in more bees in the South, including Florida and Texas. On top of that, increased spraying of orange, lemon and grapefruit groves there to control Asian citrus psyllid, which spreads Huanglongbing disease, prompted beekeepers to find a less-threatening environment in which to place their hives. “California was an obvious choice for them at this time of year,” Wardell says. Growers like to see eight frames of bees in their hives. Many will pay a bonus for more. Most almond growers sign contracts with beekeepers in July and August to deliver bees for the following season. Concerns last summer about a possible shortage of bees from the upper Midwest for this year’s bloom pushed rental prices up about $10 to $20 a hive this season, Wardell reports. One estimate puts the average prices of colonies this year in the $160 to $170 range. Once almond flowers open and begin shedding pollen, bees can pollinate a tree in full bloom in about four or five days. However, the bloom in orchards tends to stretch out over several weeks as different cultivars come into bloom and each tree spreads out its blooming period, large in response to such environmental conditions as heat, humidity and soil moisture. Almond flowers provide a rich source of pollen and nectar for the bees. For them, the annual California almond bloom, which has been called the world’s largest pollination event, is the jackpot of all pollen-nectar jackpots. During bloom, growers commonly stock their almond orchards with two colonies per acre. In all, pollinating their 810,000 acres of bearing trees requires about 1.6 million colonies — two-thirds of all the commercial colonies now available in the United States. With another 60,000 or so acres of trees expected to come into production in the next few years, the demand for bees will only increase. 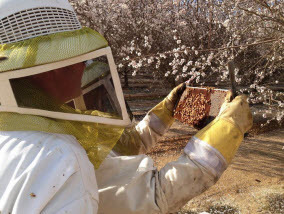 Meanwhile, the number of bee colonies has been static, if not declining, raising the possibility of a future shortage of bees for California’s almond bloom. About 200,000 to 400,000 colonies needed for the almond bloom come from California apiaries. The rest are trucked in by beekeepers from various parts of the country, many of them in the Plains and Upper Midwest. In the past few years, beekeepers in some of those areas, such as Nebraska and the Dakotas, have been losing prime forage land for their colonies. Attracted by strong prices, farmers have been replacing alfalfa and clover fields with corn and soybeans, both of which our poor food sources for bees. This has resulted in weaker colonies. In the absence of natural forage, beekeepers are forced to feed expensive, but less healthful, sugar syrup and protein supplements. Typically, this intensive, supplemental feeding starts when crops and other vegetation begin to dry down in later summer and continues through the winter. That’s when bee colonies naturally reduce their numbers from say, eight frames per hive, to just three or four to survive. However, last year, drought prompted many of California’s beekeepers to start feeding their colonies right after bloom, continuing through December.